The original Solfeggio harmonics used in Gregorian Chant is a specific scale that differs from the Western Chromatic Scale. The Solfeggio scale is derived from intrisic or Pythagorean tones that resonate with our geography and cosmos. Intrinsic tone may be derived using the mathematics of PHI or geomantically – such as the middle C given by the great stones on Summer Solstice. The masterpiece “Curse or Cure: it's in the Numbers” by musicologist Joe DeBrouse (now suppressed on the internet) gave the derivation of the Pythagorian tones using the mathematics of PHI. Http://www.bodyvibes.com/cursecure.htm. Middle C in the human vocal range should resonate with the earth's spin on its axis. The Italian monk Guido d'Arezzo (990-1050 A.D.) created the system of Solmization using syllables to represent the tones of the scale – the Guido System. 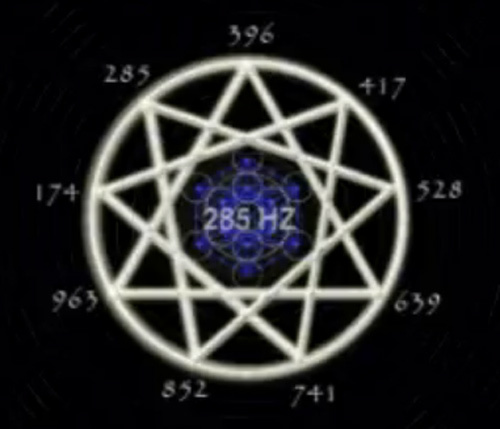 The Solfeggio frequencies stimulate healing and body repair. Mi heart / thymus and the ability to believe strongly for the renewal, transformation of the self and life situations. The thymus is the master switch of the immune system and this is the tone that is linked to genetic expression which can be switched on or off by word and tone. Fa thyroid and communication, expression and relationship. La the bio-electic field of the ensouled matter, the spirit of the person and his or her 'field', its order and the order of the cosmos.